Weibo is a social networking and micro-blogging site where people post and communicate in short messages. On Weibo, people can follow other people and companies, to discover useful and interesting information. When someone follows your Weibo account, she/she becomes your follower. When you post a new short message on Weibo, your followers will be able to see it in their Weibo home timeline. Sometimes my foreign friends tend to see Weibo as “a copycat of Twitter”. That kind of makes sense, since both of them are microblogging platforms, where you can draft and post short messages. However, be cautious that an oversimplified definition like “Twitter’s copycat” doesn’t tell what Sina Weibo really is, because when you put your hands on it, you can find so many differences between them. The visual difference between a verified Weibo page and an unverified Weibo page is a blue checkmark, but getting your Weibo account verified will surely bring you more benefits than that. People are facing with the rise of fake or questionable news sources today. We are becoming increasingly wary of where our content comes from, and want to know if we are interacting with real people and businesses. Verifying your Weibo page is an excellent way to earn trust and prove your business is the real deal. By having that blue checkmark on your Weibo profile, you will ensure your audience that this is no imposter they’re looking at. Authenticity - Weibo confirms you are whom you say you are. Audience centralization - no more imposter or fan pages that distract your audience. Visibility - your Weibo page will rank higher on the list of searched items. It is entirely different to register and verify a Weibo account as a foreign business than a local one registered in China. For example, creating a Weibo page as a foreign business will have a verification fee of 1,000 USD, compared with 300 RMB for a Chinese company. Also, you will need to contact Weibo’s VIP customer support by email to get your account verified, instead of submitting your business license directly via Weibo's web interface. Step 1 - Go to Weibo. Click Register a New Account. You should see the page below. Here we recommend you register as a Personal Account first. Because you will need to get verified on Weibo by exchanging emails with Sina’s VIP customer support anyway. Registering as a personal account can at least save you some time compared with registering an official account in this step. Step 2 - After filling out the details and submitting the form, you should receive an activation email. Click the link to activate your Weibo account. To avoid malicious registration, Weibo may ask you to verify your phone number by doing an SMS verification. Now you should have your personal Weibo account ready. Step 3 - Contact Sina’s VIP customer support to verify your Weibo account. Their email address is vhelper@vip.sina.com. Company Registration Documents with certified Chinese translation copy. Company’s seal or legal person’s signature should be included. Application letter and third-party authorization letter. Company’s seal or legal person’s signature should be included. Note: Please have all required documents above and send to vhelper@vip.sina.com. There will be a verification service charge and may vary by country or region. We do it a lot, and based on our experience with Weibo, preparing the documents above is not necessary before you get in touch with Weibo, because your inquiry will first be sent to their headquarter, then forwarded to a local branch such as Weibo Hong Kong or Weibo North America. They will usually give you a longer list of documents that you need to prepare, with examples and detailed instructions. So our suggestion is you just contact them to address your needs without preparing the documents. Be sure to include the name of your company and the URL of the personal Weibo profile you have just created in the email though. Step 4 - Prepare the documents. Step 5 - Pay the verification fee. The fee is 1000 USD for most countries. Weibo will ask for a screenshot or something alike as a proof of payment. Other options for a foreign business? 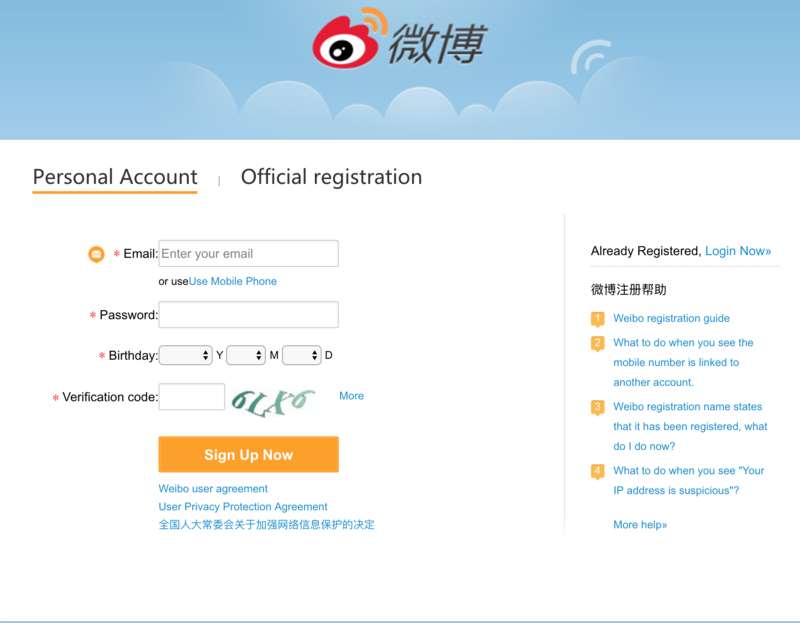 Yes, you can also choose to register and verify your Weibo page using a Chinese business license. Weibo will ask you to submit an authorization letter to prove the Chinese company is authorized by your company to register a Weibo page using your business name, logo, description and other information. Below is the template we use in Shifu. Feel free to download it here. After filling out the required information, you also need to put your signature or company stamp on it. As you may know, Baidu Ads (also known as Baidu PPC or Baidu phoenix nest) is by many measures the most popular paid search platform used by Chinese search marketers. Beyond that, there are a few 2nd tier PPC platforms.